His sire - Matrix Majesty! DESCRIPTION: Snowmass Matrix Majesty is the absolute real deal! 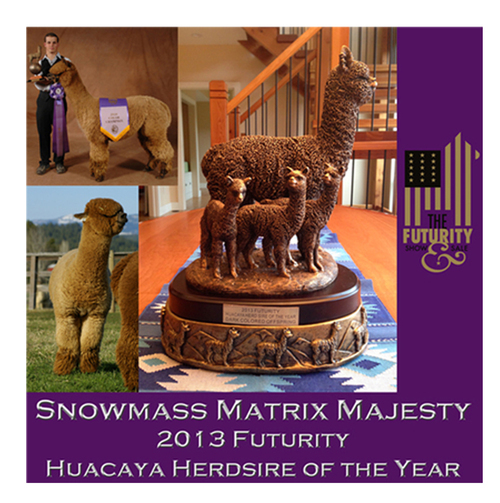 Majesty was just awarded Dark Herdsire of the Year from the 2013 Futurity (where three of his little CCNF cria also helped him win the Get-of Sire Class) in addition to his previous awards as the Reserve Dark Herdsire of the Year at the 2011 Futurity as well as being the Fawn Champion at the 2010 Futurity. Majesty is the genetic amalgam of some of the greatest names to ever grace the North American alpaca herd. Herdsires such as Chaccu, Legacy, Hemingway, Quechua, Matrix, Elite, Augusto, Accoyocusani, and Bueno are all present. Also present in his pedigree are the famous rock star dams PPP Prestige, 4P Isabella, PP Jesusa, and Snowmass Maree Love, the first three of whom we also had the great privilege of having here in our foundation herd late in their lives. Needless to say the genetics in this guy are stacked and it shows. We had Majesty's first crop of crias born here in 2012 and if you have any doubt as to his quality or more importantly his ability to replicate that in his progeny, you need only visit CCNF's pens throughout the 2013 show season. Snowmass Matrix Majesty displays the amazing fleece characteristics that the Quechua line has become known for: the combination of elite fineness and uniformity throughout while sacrificing nothing in density. Now fully owned by CCNF and primarily used within our own herd where we play him off of the Ring of Fire line, we have also opened Majesty up for limited outside stud service in 2013. Please email or call with any inquiries. Out of the West Penn breeding program and now residing in the famous Snowmass herd producing for Julie and Don Skinner, registered crias from 2009 to 2013. Daughters producing for the Snowmass herd. 2015 Histogram just in AFD 23.9 SD 4.7 CV 19.6 CF 90.9 Curve 42.6 at 4 years old!!! He is hanging on to that fineness!!! How do you pick a really great herdsire? I use the 4 P's.. Pedigree, Performance, Predictive Data and Personal Evaluation.. so why did I pick this one? Pedigree. WELL Matrix N Gold has a pedigree packed with powerful ancestors.. and we start with his sire Snowmass Matrix Majesty who is putting some incredible cria on the ground, Judges Choice after Judges Choice, helping CasCadNac win Breeder of the year, year after year, Herdsire of the year himself 2013. He is just a WOW. 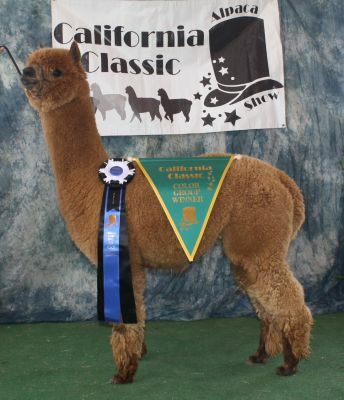 And Goldies sire's is the genetic amalgam of some of the greatest names to ever grace the North American alpaca herd. Herdsires such as Chaccu, Legacy, Hemingway, Quechua, Matrix, Elite, Augusto, Accoyocusani, and Bueno are all present. Also present in his pedigree are the famous rock star dams PPP Prestige, 4P Isabella, PP Jesusa, and Snowmass Maree Love! WHEW! And then add to that stack of names 4Peruvaini Altiplano Gold AND 6Peruvian Godfather from his dam's side. This is one POWERFUL pedigree - and great diversity in this pedigree. There is also COLOR in this pedigree. Goldie's sire has thrown ALL colors including Black.. so I expect to find the same range of color in Goldie. Performance. Goldie has won THREE championships himself. His sire, well, I think Herdsire of the Year speaks for itself - THAT is performance! His dam, while showing with West Penn Alpacas, won a 1st, 2nd and 3rd.. but what makes her important is what Snowmass values her for.. they purchased her from West Penn as a yearling and she has been delivering crias for Snowmass since then. SO since she is still IN Snowmass's breeding program - And they have her daughters still in their breeding program - I would rate that as TOP performance! Predictive Data. Goldie's 2014 histogram at 3 years old: AFD 22.1!! SD 4.5; CV 20.5 CF 95%!! Thats a NICE histogram! His Fleece Score from his 2013 fleece - Gold Country Fineness/Handle 19.5 out of 20!! Consistency of Micron 7.5 out of 8!! Consistency of Length 7 out of 7!! Consistency of Color 4 out of 5! Crimp Style 8 out of 10! Density 4 out of 5!! Brightness 7 out of 10. Lack of Guard Hair 8 out of 10 (and that was a bit of skirting issue).. so from a predictive view we can say he is retaining fineness and consistency.. We will have EPD's by December since we enrolled him in the EPD program this summer. I expect fairly good ones - especially in the fineness rating.. Personal Evaluation. Matrix in Gold has a square medium frame. Large bone. Level topline. Perfect angulation. Excellent bite. Wedge shaped pleasing head. Perfect ear set. Good sized testicles. Gentle disposition. Gentle breeder. His fleece exhibits a buttery hand, well aligned crimp, good density and fair brightness.